Arcadia – O Hei There! I hadn’t been back to Chang’s Garden in years, before going with my grandparents a couple of weeks ago. Jonathan Gold describes the cuisine there as Hangzhou (as evidenced by their famous dongpo pork), but the restaurant’s menu covers all Eastern Chinese cuisines. You can get your fix of Shanghainese dishes like XLB or fried fish with seaweed, or even order non-Eastern Szechuan dishes if you want something spicy. But definitely stick to Eastern dishes; you wouldn’t want to waste the drive to Arcadia just to order kung pao chicken and mapo tofu at a place that doesn’t specialize in such dishes. Since it was just me + the grandparents, we didn’t order much. 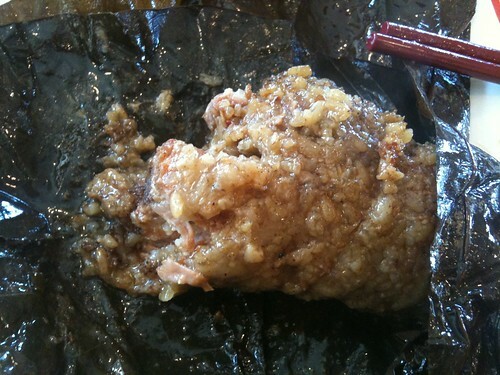 No dongpo pork on this visit unfortunately, but the pork spareribs wrapped in lotus leaf more than made up for it. 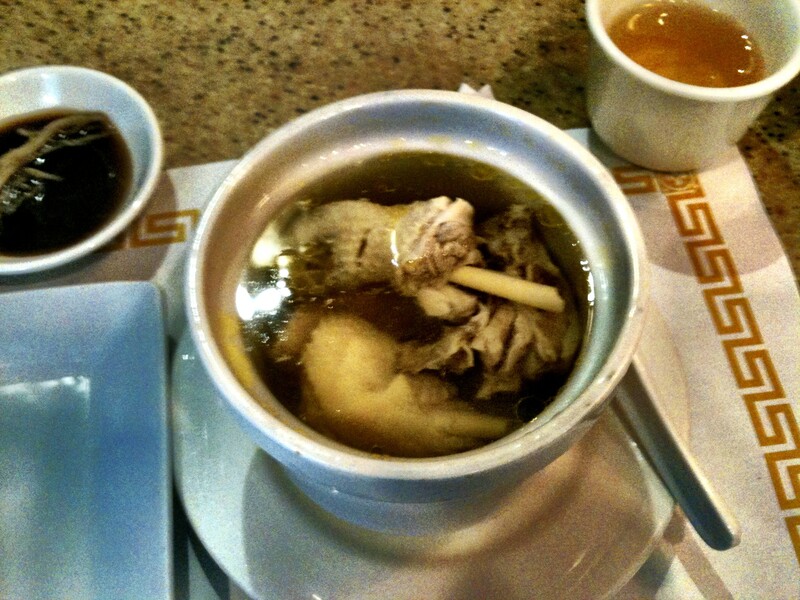 Each rib is wrapped individually, and is steamed so well the meat falls off the bone. 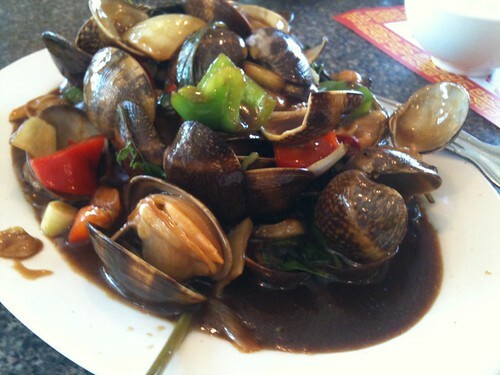 Very heavy dish, with the combination of oiliness and the heft from the glutenous rice flour, but so worth it. 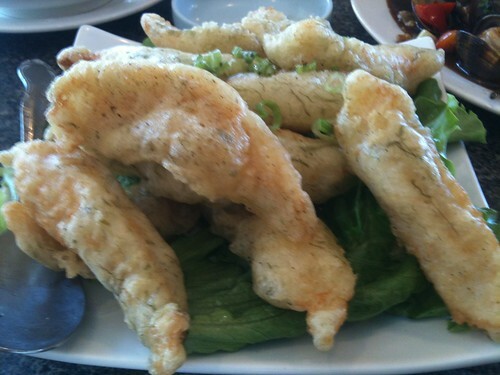 The fried fish with seaweed was as good as any variation I’ve tried. The other two dishes we had just couldn’t hang with these two: the soup and clams. Grandparents wanted those, so no problem. But if I were to go again (and I will), I’ll get the ribs, fish, dongpo pork, and the pancake with green beans (think veggie version of beef rolls). After all these years, still up there among the best Eastern Chinese restaurants. 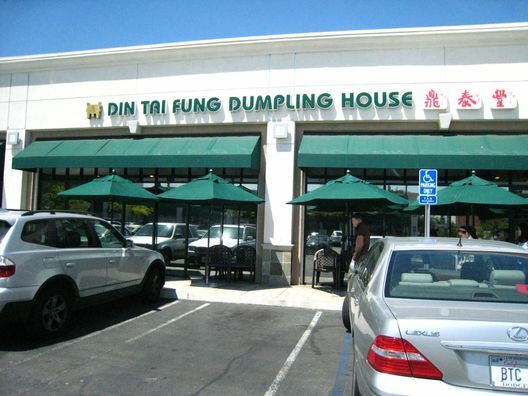 I’d go there over Din Tai Fung. And no, I didn’t stutter. Family took grandpa out for his birthday a few weeks ago and he chose…Wood Ranch. Apparently he loves the place. Didn’t know grandpa had the palate of a high school Chris Hei (used to love it back then, and went to the one at The Grove a bunch of times). Jokes aside, Wood Ranch ain’t too shabby. Comparable to Bandera in my opinion, but you don’t need to be 50+ and have a smoking jacket to feel like you belong (cheaper too). I was a fatty and got the BBQ combo of three: tri-tip, baby back ribs, and roasted chicken. The tri-tip is supposed to be one of their signatures, but they refuse to serve it under medium. And even though I ordered it as such, it came out on the well-done side. Tasted decent, but the doneness of the meat killed any tri-tip libido. Same with the lifeless chicken, which I only got to counter the BBQ red meats. 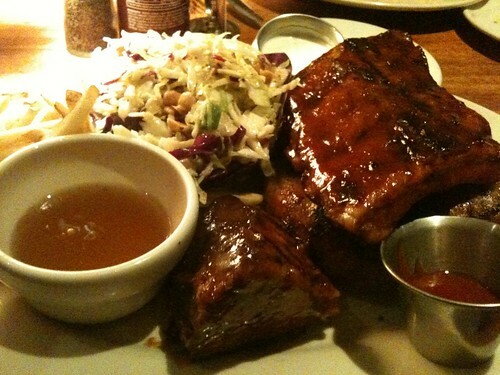 The ribs, however, were pretty good. A little heavy-handed with the sauce, but were juicy and flavorful. If grandpa wants to come back, I’m getting a slab of ribs, and nothing else. Our basketball team (myself, Han, Kevin, Lawrence, Zhu^2, Jeremy, and Travis) came here from Industry after a game last month. 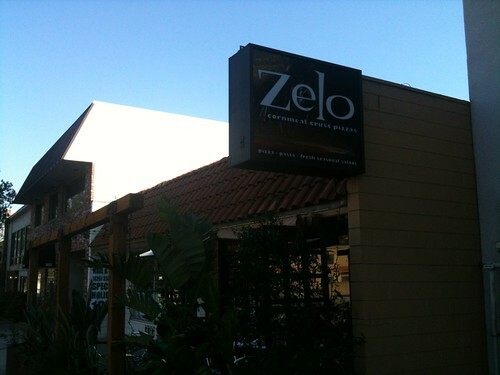 I’ve had Zelo once, a long time ago, so I didn’t remember what the place looked like (which is why we drove by the place without noticing at first). I think we went around 2pm on a Saturday, and the place was empty. We had the outside patio to ourselves. Jeremy got there first, and he’s quite familiar with Zelo, so he started us off with a whole corn pizza + sausage, and a half and half of spinach pesto and potato pancetta (which was one of their specials). 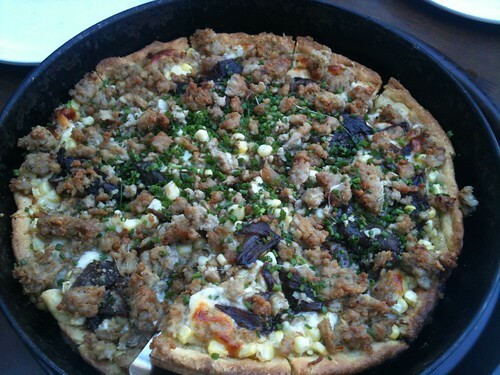 Zelo is known for their cornmeal crust, which I’m sure most people haven’t had before. It is absent of the dough-iness you’d find in “regular” pizza, instead having a nice crunch of sorts from the cornmeal crust. It is also a bit heavier in my opinion, so you’d probably eat less slices than you expect. 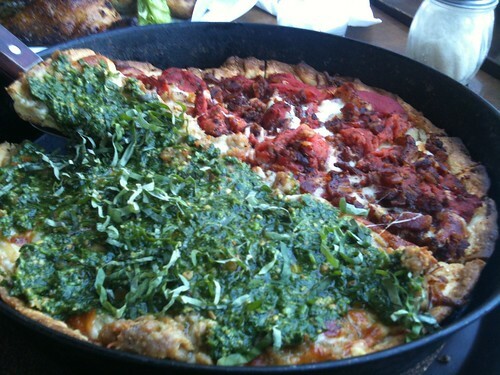 The corn is their signature pizza, and for good reason. The combination of fresh corn and caramelized onions is hard to beat, and we got our protein fix with the added sausage. The others were pretty good as well, though not nearly as good as the corn. Lawrence proceeded to order an additional half pizza, the wild mushroom, probably because he wanted to be heard (he turned from his seat and literally yelled at the window, which did nothing to stop the projection). It was pretty good as well, but tasted kind of mild in comparison to the other pizzas. I’ve been spoiled by the Neapolitan pizza craze that has hit LA, ever since first inception. And I still prefer the best of what that trend has to offer. 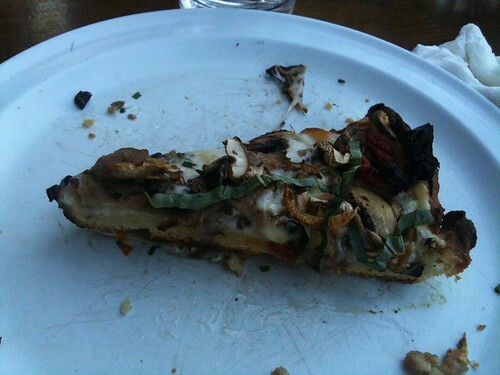 But the pizzas at Zelo were a nice change of pace, and if I lived in Pasadena, it would be a regular haunt. 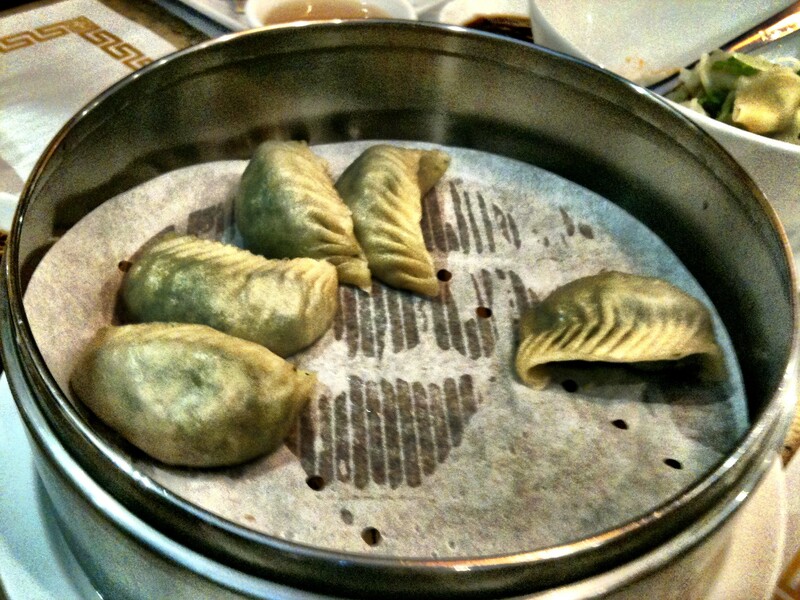 Vegetarian Dumplings (10 pcs) – I usually don’t order vegetarian dumpling, but these were quite tasty. The skin was a little thick in my opinion, but not to the point of it being doughy. 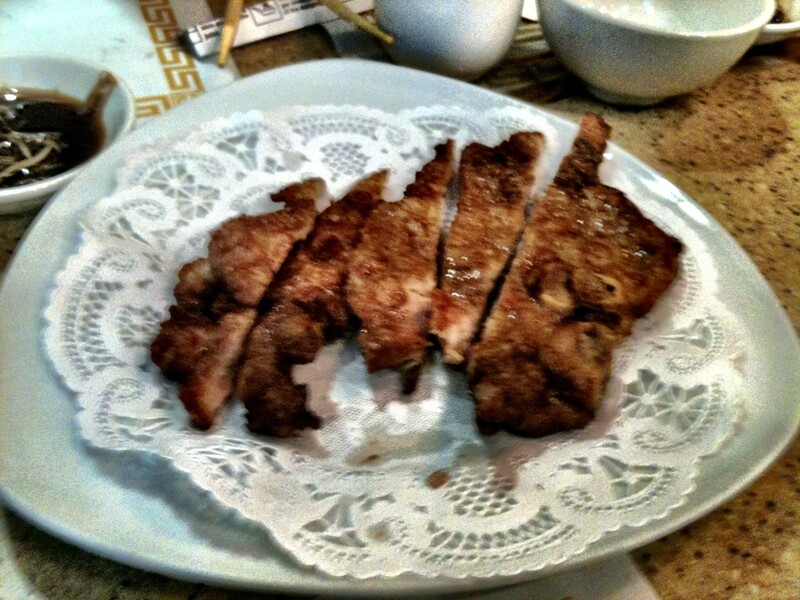 Fried Pork Chop – I can never say no to Asian fried pork chops. Their version wasn’t breaded, but was still fried pretty well. 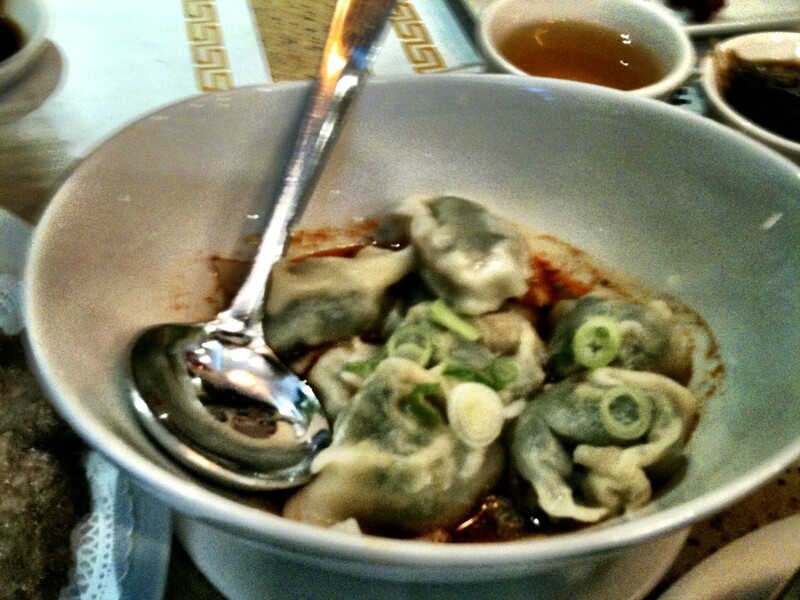 Szechuan Style Vegetable & Pork Wontons – We ordered two of these. Doesn’t have the kick or flavor that you get at authentic Szechuan restaurants, but the wontons themselves were good. 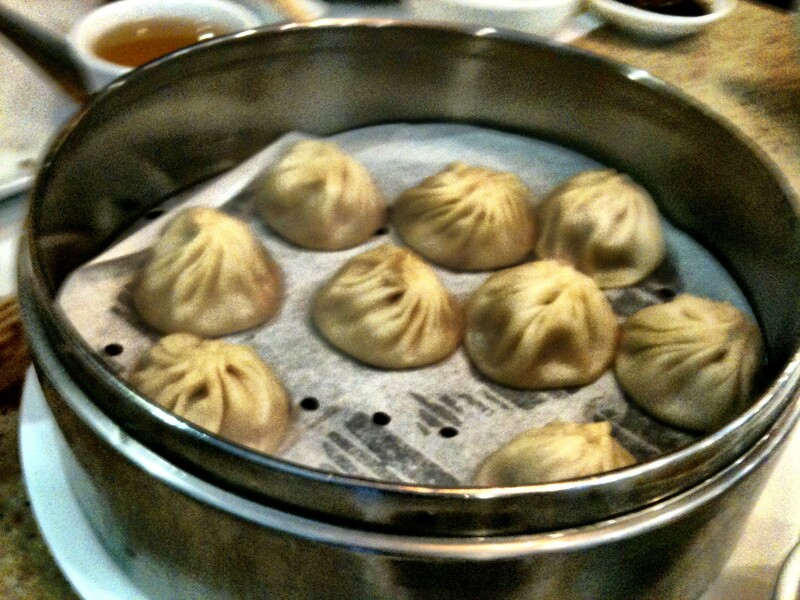 Juicy Pork Dumpling (10 pcs) – The main event – the reason to go to Din Tai Fung. 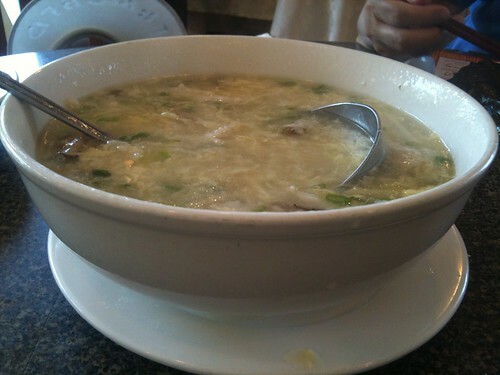 We ordered SIX of these = 60 dumplings. Much better than what I remembered. I don’t think that they’re world-class necessarily, but the skin was thin enough as not to break, the filling was delicious, and the juice/soup was great as well. We went at around 3pm, and still had to wait around half an hour. Despite Han’s numerous requests/complaints to the waitresses, service was still fairly cordial and quick (once we finally sat down of course). 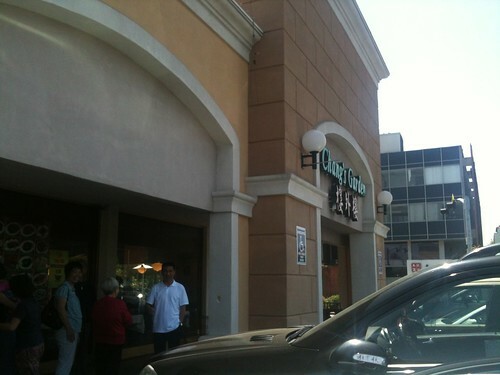 I would probably go to Din Tai Fung on a more regular basis if it wasn’t so busy all the time. Just hope that this visit, not my previous ones, is the standard for the restaurant. 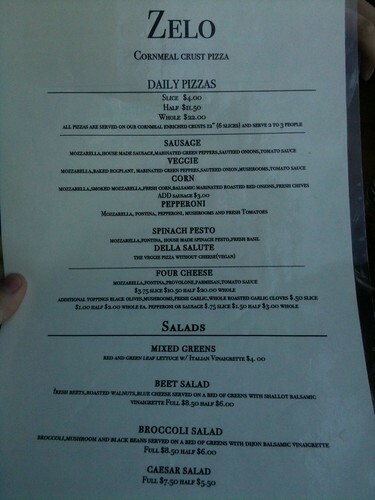 Note: credit Food GPS for the first photo.